Hi, this is a quick and simple card using #CoffeeHouse by JustRite Papercraft that I'm entering in the final hours of the Fall 2016 Coffee Loving Papercrafters Blog Hop! In addition, I used papers from the gorgeous Fall Plaid paper pack by #LawnFawn and enamel dots from Echo Park along with a little gold twine. Kat Scrappiness and Cheery Lynn Dies Witches Skirt Part 2! Hi everyone! I'm back this month with Kat Scrapiness showing off this really cute die set by #CheeryLynn called #WitchesSkirt again. You may not recognize it as the same die I used last time because I changed the look. Everytime I saw those stockings, I thought, Wizard Of Oz, so i had to go for it! I created my base by taking a brick embossing folder (for my yellow brick road) and ran a piece of light yellow card stock through my Big Shot. I then distress inked it using #FossilizedAmber I cut a piece of black cardstock (slightly smaller than A2 sized) and angled the brick and trimmed off the excess on all 3 sides. Then I took the largest die from the #KatScrappinessStitchedRectangles and cut some kraft cardstock strips for the house siding. I layered it on an angle and trimmed the 3 sides to match the base cardstock. I finished off with some sequins by #KatScrapiness in the #MargartiaMix and some enamel dots and plaid ribbon by May Arts. I hope you like my project, please leave a comment if you have time! And don't forget to visit Kat Scrappiness to shop for the great products you've seen here today! Kat Scrappiness Shop - Enter Here! Kat Scrappiness World Cardmaking Day Challenge - Sales and Sponsors! Hey everyone, I just wanted to tell you about an amazing challenge coming up! Mark your calendars and get ready to enter your project for a chance to win some great prizes! Hello Crafters! October 1st is World Card Making Day and Kat Scrappiness is celebrating with a SALE, as well as a Card Making CHALLENGE with tons of great prizes from our generous sponsors! The sale at Kat Scrappiness will begin on October 1st and will end on October 3rd. We will post a coupon code for you here on this blog so be sure to subscribe to receive an email notification! The card challenge will begin on October 1st and will remain open for one week. We will choose all of our winners on 1/8 at 12:00 pm PST. Take a look at our list of sponsors! Click Here to take the Fall 2016 Coffee Loving Papercrafters Blog Hop! I'm back with a second card for this awesome Fall Coffee Loving Papercrafters Blog Hop! Today I wanted to show you a card that I made using the very popular stamp set CoffeHouse by #JustRitePapercraft It's a large set, full of great images and endless possibilities! I created the background base using the stripe in the brand new #PlayfulPaintedTrioBackground Stamps on kraft cardstock. Then I distressed the edges with Tea Dye Distress Ink and splattered with some watered down white acrylic paint and added gold glitter Doodlebug dots. The tiny cups on the banner and large cup were all watercolored with distress inks..doesn't that look like paper you'd buy? Nope, I created that look using stamps and distress inks, I just love it! You can click on the product pics OR here's the link to JustRite and you can look through all their fun products. JustRite Papercraft - Click Here to Shop! Thank you so much for stopping by! Have an awesome time hopping along with your favorite coffee/tea beverage! Winner announcement! Night Owl Fall Coffee Project for the Coffee Loving Blog Hop and KatScrappiness - Blog Candy! ***winner announcement - the winner of the prize package sponsored by Kat Scrappiness...Princess Judy Palmer!!! Please email me at rutabagapiedesigns dot gmail dot com to claim your prize. Thanks to everyone for leaving a sweet comment on my blog during the hop! 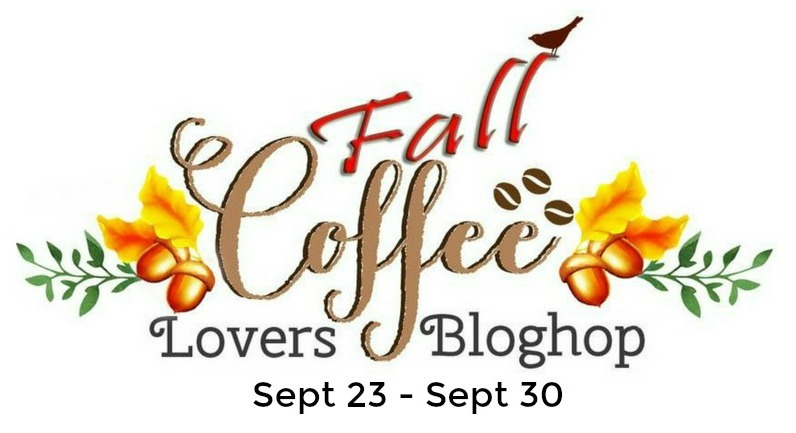 Click Here to take the Fall Coffee Loving Cardmakers Blog Hop!!! KatScrappiness Blog Post for Coffee Loving Papercrafters Blog Hop! Oh wow, it's that time again! My favorite hop and my favorite season combined! First off, I'd like to thank Amy Tsruta and all the people responsible for facilitating this great hop! So much work goes into it, and I just want to let you know how much I appreciate it! Today I'm showing you a card I made using products from the #KatScrappiness store, as a Design Team member.
. This sale is storewide! Make sure you check out her entire stock of dies, stamps, sequins and more! I distressed inked the inner moon in Fossilized Amber, Carved Pumpkin and Tea Dye. The clouds were distressed in Black Soot and then I sprinkled it all with some watered down white acrylic paint. The image was copic colored as well. Kat Scrappiness Store - Click Here to Shop! I hope you've enjoyed my project! Thanks for stopping by! But wait! I'm offering some amazing blog candy today!! All you need to do is be a subscriber to my blog, then comment below how you follow me! I'm giving away 1 set of the double stitched rectangles, a bag of Kat Scrappiness Espresso sequin mix AND a bottle of #StrongCoffee #EnamelDotDrops by #FabrikaDecoru, (which is not in the picture, but will be added to prize package), compliments of myself and KatScrappiness, all to 1 lucky follower! Winner will be chosen at end of hop! Hi everyone, I'm so excited today to show you my very first DT project for KatScrappiness! I'm here showing you this really fun die by Cheery Lynn Designs named "Witches Skirt". I started with a 5x5 black cardstock base. I used the Uniball White Gel Pen to create the dot and dash pattern all the way around the perimeter, then layered some orange swirled pattern paper and my Bats #2 Stencil by Echo Park Paper Co. Witches Skirt Die - Click to Shop at KatScrappiness! I didn't have any Halloween themed background paper, which is shocking considering I have sooo much paper! So instead I used this really fun stencil above ^^^ by Echo Park Paper to create the background bats. I just started with some purple cardstock and used some Wilted Violet Distress Ink by Ranger to create the tone on tone. Then I lightly hit the edges with a little Black Soot Distress Ink. I cut out my Witches Skirt in Black and then cut the words "Happy Halloween" out in the swirled orange and then one more time on the legs in white to make my striped socks! And lastly some lime green eyelash yarn which I thought was kind of fun across the top and went with the sequins too. Well, thanks for stopping by today and I hope you liked my project. There are plenty of links here on my page, so hop on over to KatScrappiness for a little shopping! Hello, wow is it Friday already? It's been a busy and hot week here in North Carolina. We are gearing up for moving into our new home on Monday, and my son has baseball games all weekend. So, it's good I found a little time to get my latest card blogged today! So sadly, someone in my family is going through a really hard time. I thought this would be the PERFECT card to send off today, I'm hoping it will bring a little happiness with it. Thank you so much for stopping by, I would love to hear from you if you care to comment! Hi everyone, it's hump daaaay! So I'm here showing you a couple of really simple baby cards that I'll be attaching to gift bags for two special little bundles of joy! My husband and I own a business and a long time ago, we decided one thing we'd do is spoil our customers when they have babies. We fill the largest gift bags we can find full of fun baby stuff. It always goes over amazingly well, the new parents are so excited! I love shopping for babies, so it's a win for me too. So just recently, we welcomed 2 new little ones into our work family, a boy and a girl! I needed to make a couple of gift cards quickly. I was so fortunate to be able to grab this set, "Cute As A Button" by Reverse Confetti! I'll list all my products used below for you, just click on the pics to shop! The dimensions of these cards are 4x4 and the plaid layer is 3.5x3.5. Thanks for stopping by, I hope you enjoyed my little baby cards! Hey everyone, Kat's got a really sweet deal going on this Labor Day weekend, pop on over and you'll find brand new Lawn Fawn, Carta Bella, Echo Park, Doodlebug and MORE! Shop now! 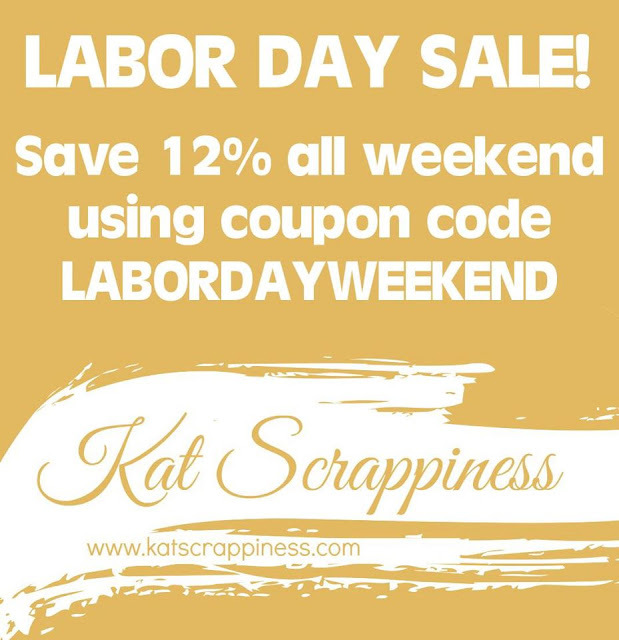 Kat Scrappiness Labor Day Sale - Click To Shop!